Attach a monitor to your Tiltamax Gravity G1, G2, or G2X gimbal with this Monitor Bracket from Tilta. The aluminum bracket attaches to one of the rosette connectors on the gimbal and allows for 360° rotation. 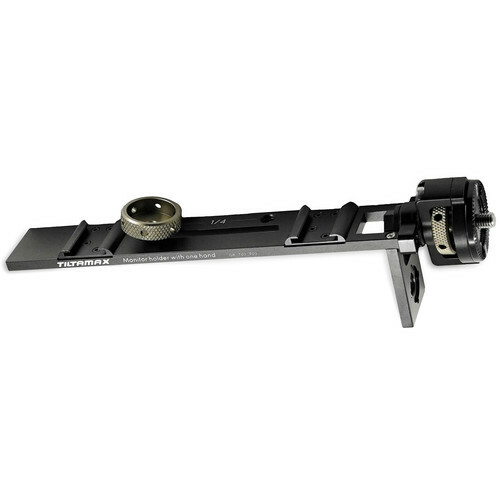 The monitor mounts onto the 1/4"-20 thumbscrew which can slide along a 2.5" slot for preferred alignment. The bracket offers two shoe mounts, two 1/4"-20 threads, and one 3/8"-16 thread for mounting additional accessories. Box Dimensions (LxWxH) 8.4 x 3.55 x 1.65"
Monitor Bracket for Gravity G Series is rated 5.0 out of 5 by 1.